I got up around 7, since my flight didn’t leave until about 10. This gave me plenty of time to enjoy breakfast in the Club Lounge of the Renaissance Tampa International Plaza Hotel. 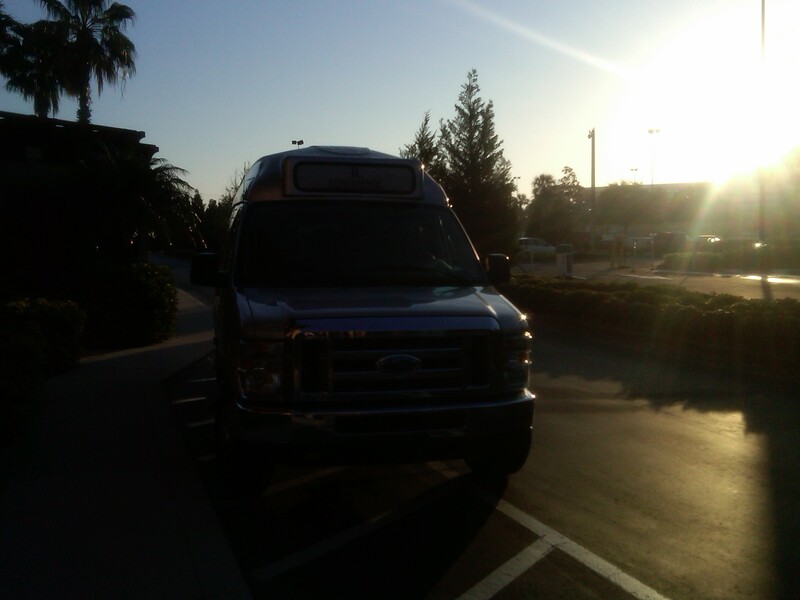 I ended up having to wait about 10 minutes, but after checking out I hopped on the shuttle to the airport. I thought I had way more than enough time for checking in and making it through security at this point, but I soon would realize how horrifically wrong I was. 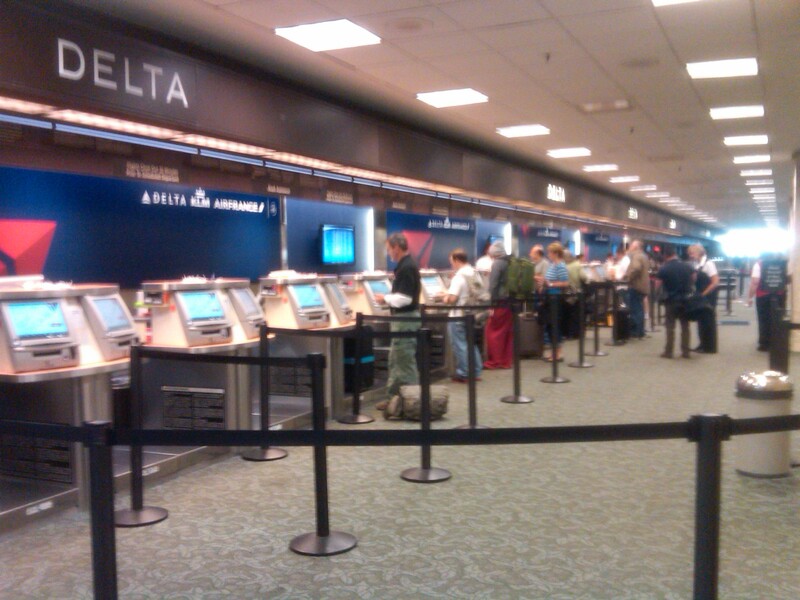 Anyway, check in end up being a breeze as there was absolutely no wait in the Sky Priority queue. As I was heading to security, I began to panic. I went into to my wallet to retrieve my ID, and that is when I noticed it: My credit card was missing. And not just any card, that special American Express “get me into the SkyClub free” Platinum card. My initial re-action was that I had left it in the the pocket of the shorts I had packed away in my suitcase. So the gal at the check-in to see me again when I came back to inquire about recalling my suitcase. I frantically when back downstairs to the baggage claim area, and was soon able to retrieve my bag. I searched frantically through my bag from pocket to pocket, multiple times even. No sign of my wonderful card. RATS! I re-checked my bag, and remembered the last time I remembered holding my card was the night before, in the midst of my car rental fiasco there at the airport. (As a side note, I contacted National some time back and the “sneaky” charges I referred to were re-funded). I went back to the National rental office, and asked about my card. The agent at the desk was extremely professional and helpful, and he said they had locked it away earlier that morning. Fortunately, a manager had seen it laying in the ground outside of the office, and she collected it. My ID was checked, and was returned my missing credit card. SWEET SUCCESS!! I walked in, went through security (hardly wait in either the regular or Priority lien) then hopped on the shuttle to the terminal. 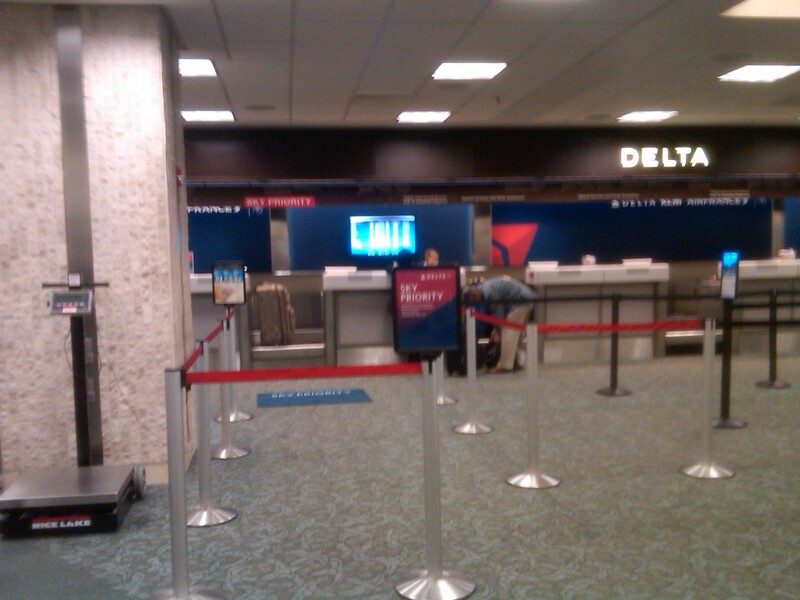 By the time I made it to the gate, boarding had just begun. After a slightly stressful experience, it was nice to know that my upgrade had already cleared and I would be in First Class. 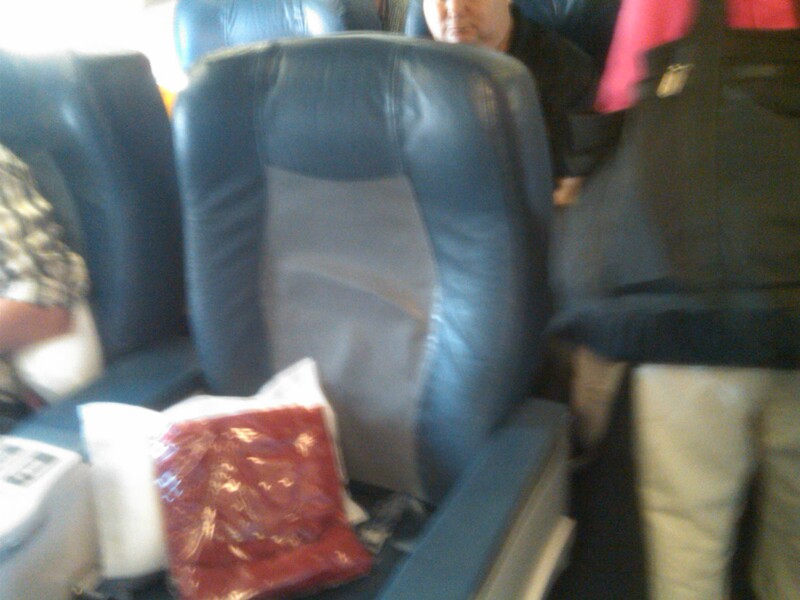 I arrived on the aircraft, came to my seat in 1A which had a small bottle of water, a pillow, and a blanked waiting for me. I placed my bag in the overhead since I was in the very first row, and was soon offered a pre-departure beverage. I was in for quite the experience, as this was the kindest and most courteous Delta flight crew I have encountered, as I will get to. Boarding took about 10-15 minutes with little issues (other than freaking out and thinking I forgot my laptop at security) and we were off. 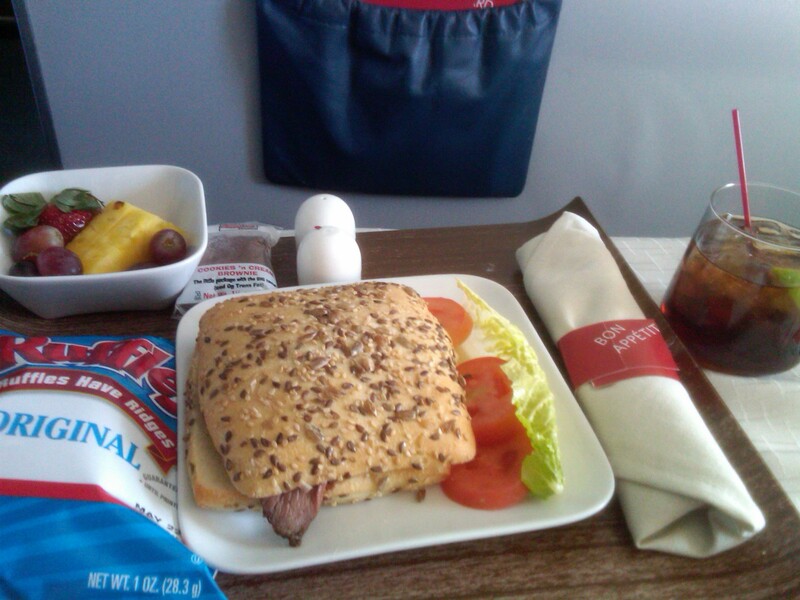 Being in 1A, I was offered my choice of salad or a sandwich. I had read somewhere (and it makes sense) that flight attendants love it if you just take what is left. So I offered to do that, and the flight attendant thanked me for doing so. Throughout the whole flight the crew, especially the lead flight attendant working First Class, were very attentive with drinks and food, and extremely helpful about meeting passenger needs. For example, some would complain about a flight attendant not asking “Can I offer you another drink,” but mine simply said “More?” Straightforward and to the point, which doesn’t bother me. And she was actually be pro-active. Even more important, they acted very professionally and acted with a genuine passion and enthusiasm that cannot be faked. I was sincerely thankful for the EXCEPTIONAL service I was receiving, so I decided to make sure it didn’t go unnoticed. I understand that Platinum and Diamond Medallions are given “A Job Well Done” certificates, which the attendants can turn in to receive points which are exchanged for various rewards, such as electronic gadgets. Even though I am a “lowly” Gold Medallion, and I wasn’t going to let that get in the way of presenting a gesture of my gratitude, and making sure their management recognized the great service that they were providing. So I drafted it up a note with my reformed chicken scratch elegant writing, than re-wrote it to make it look nicer. Unfortunately, I lost the draft version I wrote, other wise I would share it with you here. I did mention how thankful I was, and how kind, professional, and courteous the flight crew was. I handed it over to her, and here face lit up. She seemed very appreciative, and even shared it with the other flight attendant who thought it was great. I had no problems getting my copious refills, and the flight from heaven ended far too soon, before I entered the you-know-what that is New York LaGuardia.